Mercedes continued to set the pace at the Malaysian Grand Prix weekend as now it was Nico Rosberg who topped the times in second practice. 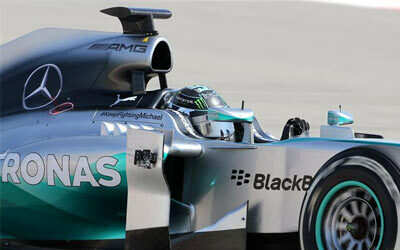 Lewsi Hamilton already proved fastest in the first session earlier today. The session turned out to be very close at the top with Raikkonen and Vettel both within a tenth from pace setter Rosberg. Lewis Hamilton was just slightly more behind in fourth, while Fernando Alonso made sure that both Ferrari's classified in the top 5, a first for the season. Felipe Massa meanwhile led the charge for Williams while Daniel Ricciardo was 4 tenths slower than Rosberg. He concluded his session with an off-track moment but managed to keep his car out of the wall. At the back of the field are again the Lotus cars who mostly got into the spotlight with their ongoing technical issues. Pastor Maldonado failed to make it out on-track, while team mate Romain Grosjean suffered two gearbox issues, the second forcing him to pull off the circuit. Kamui Kobayashi was also unable to run due to the energy store issue his Caterham suffered in the morning.